Keep your foundation looking fresh with The Ordinary High-Spreadability Fluid Primer, a lightweight gel-serum that prevents makeup build-up. The High-Spreadability Fluid Primer increases the spreadability of complexion makeup to stop foundation and concealer looking unnatural and uneven. Its clever, lightweight formula limits the accumulation of pigments around the eyes and dry patches on the skin for a smooth, natural finish. In addition, this skin-softening primer boosts the longevity of your makeup with an infusion of high-flexibility silicones, which smooth and hydrate the surface of your skin for a long-lasting, beautiful finish. Apply before makeup or wear alone for a subtle dewy finish. Free from water, alcohol, oil, nuts, cruelty, fragrance, parabens, sulphates, mineral oil, methylchloroisothiazolinone, methylisothiazolinone, animal oils, benzalkonium chloride, coal tar dyes, formaldehyde, mercury, oxybenzon. Vegan. 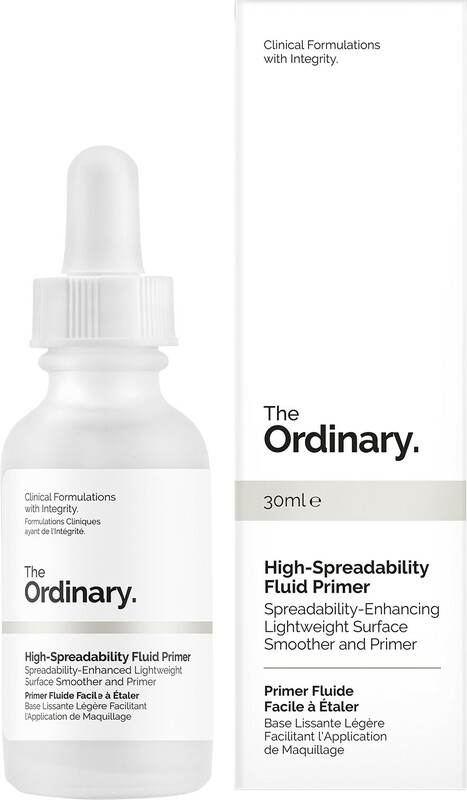 The Ordinary High-Spreadability Fluid Primer 30ml is rated 5.0 out of 5 by 6. Rated 5 out of 5 by Lupin from Excellent What a bargain! Does the job beautifully and I use it with a tinted moisturiser and it lasts all day! Rated 5 out of 5 by Jay50 from The best I have used a few primers but can honestly say this is the best. Goes on beautifully skin feels soft. Makeup goes on easier and stays put. Price is good . Rated 5 out of 5 by PaintedFace from VELVETY PERFECTION! Absolutely amazing primer & excellent value for money. I've tried many primers - budget friendly & pricey......this is by far the BEST. I've only just discovered The Ordinary products and WOW. I don't leave reviews often, only if the products really have surpassed my expectations and this really did. It's lightweight, super velvety and leaves my skin looking amazing all day. I use The Ordinary foundation on top of this primer and my skin looks poreless & flawless. I've had lots of complements about my skin & I've been singing the praises of this wonder discovery! Rated 5 out of 5 by Kami1405 from Yay I've recently fallen in love with this brand and this primer didn't disappoint! It feels like satin on your skin and spreads really really well as promised. I use between one to 3 drops on my whole face depending on how much makeup I'm putting on and it keeps it on quite well. I would even recommend putting it on when you're not wearing makeup because your skin feels so silky afterwards!